Wednesday night's class was an extra-special treat with both Andrew and Isaac Paris visiting us for a short show & tell. 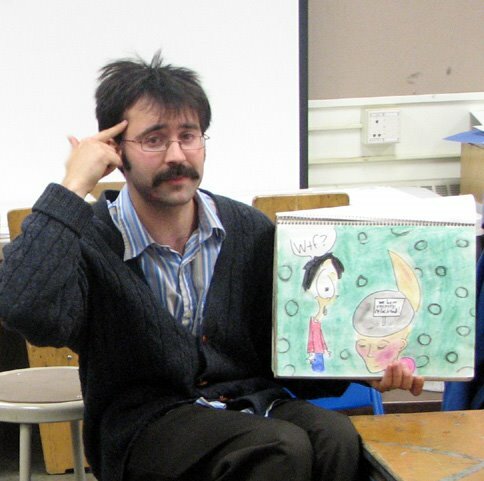 Isaac did a few performances of his "illustrated slam poetry/standup cartoonist" gig: flipping through an 11x14" drawing pad of his cartoons accompanied by recitation of poetry with an improvisational twist. He writes the poems first and then draws the pictures to them, and has put on many shows at local venues with very positive results. In fact, he said how folks would quiet down and draw closer like it was storytime whenever "Isaac and the Awkward Situations" performs. 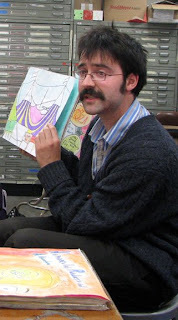 His style and technique (done in Sharpie + soft pastel & water) compliments the presentation and content - fast, bright and loose.This just blew me away, short of reading about Dan Piraro's "The Bizarro Baloney Show" I hadn't ever heard or seen anyone incorporating cartooning into a performance. Well worth keeping an eye out for at any future events to catch this really unique and talented artist's "Dr. Seuss hip-hop" act. 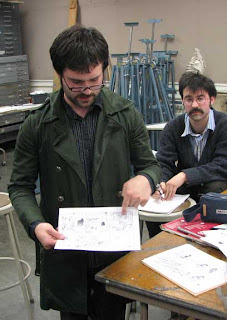 And if that wasn't enough, Andrew Paris brought in some of his work to share and talk about also: his comics had been running the past four years in the UAF Sun Star student newspaper, and pretty much were the main reason I always remembered to pick up a copy. Watching steady improvement in technique and maturation of style was something, even if I wasn't up on what the humor was in reference to, and he displays a wide range of styles (while often working in collaboration with another writer Chris Green) from the simple and sublime to lavishly detailed and wordy panels (see samples posted below). Also worth noting how prolific Andrew was: multiple features, such as "Tao of Nerdism" and "Goblin Pension Plan" appear under different pseudonyms. His works will soon be appearing on-line and I'll keep you posted when the site's up and running - definitely one of the better cartoonists to ever run in this town, and I hope to keep seeing more and more his stuff. Brings up one of the reasons I love to have folks drop by this class: to not only instill this class' students with a sense of the diverse possibilities out there in the community for them to explore and take advantage of with their own work, but I also hope it encourages all the visiting artists to keep on producing - aside from validating and supporting the medium it makes life in Fairbanks a hell of a lot better. Or at least more entertaining, which, as of late, is a crucial need just about everywhere.